You can now buy Xbox Live Arcade titles from Amazon.com. When you purchase an Arcade game, you get a code which you then have to type into your Xbox 360 console or you can go to Xbox.com an redeem your code. SEATTLE–(BUSINESS WIRE)–Amazon.com, Inc. (NASDAQ:AMZN) today launched the Amazon Xbox LIVE® Store beta, www.amazon.com/xboxlive, offering customers the convenience to purchase and gift select Xbox LIVE games, subscription cards and Microsoft Points cards. Previously games were only available directly From The Xbox 360® console or xbox.com, making Amazon.com the first retailer to offer customers digital access to codes for downloading Xbox LIVE Arcade games. Customers can choose from fan-favorite titles including “Braid,” “Castle Crashers” and over 100 other games. 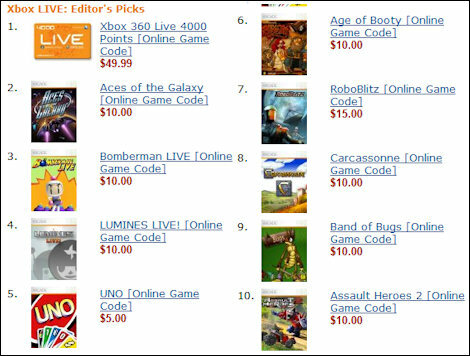 Through the Xbox LIVE Store, Amazon.com customers can easily buy Xbox LIVE Arcade games, subscriptions and Microsoft Points cards for themselves or friends and family. Points can be used to buy games in the Xbox 360 online Marketplace. The Amazon.com Xbox LIVE Store works on a code-redemption system where customers who purchase an Xbox LIVE product will immediately be able to view their Xbox LIVE code after purchase as well as e-mail that code to themselves or the recipient of the gift. Additionally, this code will reside in the customer’s Your Games & Software Library so they can retrieve it at any time. This digital delivery mechanism eliminates both the waiting time for the customer as well as reduces the waste associated with shipping packaged games and points cards. Customers can leverage Amazon’s recommendation and personalization engine to learn about new games that they also may be interested in based on similar purchase histories of like-customers. Xbox LIVE games, subscription cards and Microsoft Points cards are sold by Amazon Digital Services, Inc.